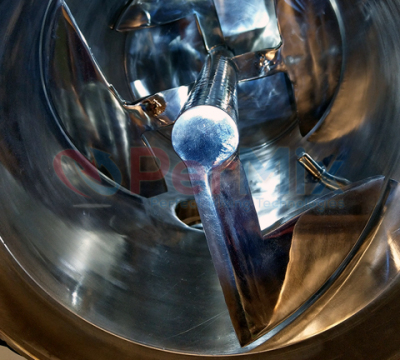 The PerMix PTP-D series Vacuum Mixer Dryer is a turbulent mixing reactor-dryer. It is used as a high-speed paddle dryer, chemical reactor or, if both processes are combined, as a dryer-reactor. They are used with particular success in agglomeration-free rapid drying, heterogeneous reactions with systems of different substances, extraction, sterilization and in general for vacuum, positive-pressure, thermal energy and comminuting aids. 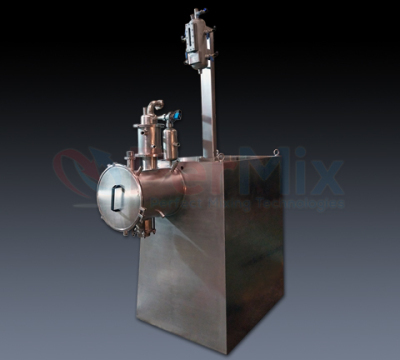 PerMix PTP-D series Vacuum Mixer Dryers are widely used in the chemical, metallurgic and pharmaceutical industries among others. Standard sizes range from 3 liters up to 5000 liters and pressure up to 50 bar. Drying times dramatically reduced with products free from agglomerates! 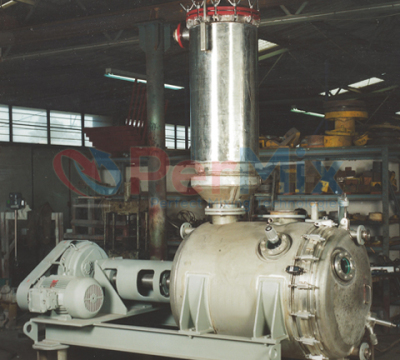 The considerably superior heat transfer characteristics of PerMix PTP-D series Vacuum Mixer Dryer are mainly attributable to the fact that external heat applied through the contact surfaces of the mixing vessel and mixing element, supplemented by frictional heat generated during the mixing process. When operating at the usual speed, this accounts for 30 to 35 per cent of the total heat applied. Heat transfer is not inhibited by agglomerates or layers of material adhering to the internal components of the tank. This is largely due to the comminuting units and the high-speed, edge-sweeping paddle agitators, which ensure rapid circulation of the materials at the contact faces. 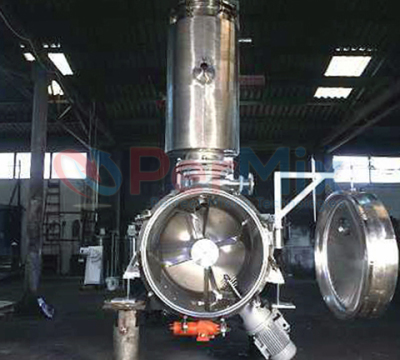 The PerMix PTP-D series Vacuum Mixer Dryer is used for drying operations usually operated at higher than critical speed, at any rate for fine drying after the phase change. In conjunction with the action of the rotary cutter and multichopper units, this causes a large degree of fluidization of the material to be dried and thereby promotes the evaporation of the fluids. The huge rate at which evaporation is effected practically eliminates the need for the usual auxiliary processes, such as scrubbing with solvents. For drying under vacuum the PerMix PTP-D series Vacuum Mixer Dryer can be filled from 50 to 75 percent. By virtue of the rapid change of material at the contact face, optimum use is made of the overall heat exchange area. The built-in rotary cutter unit ensures that the product is free from agglomerates and the grain size is so fine that, as a rule, no subsequent micronizing is required. 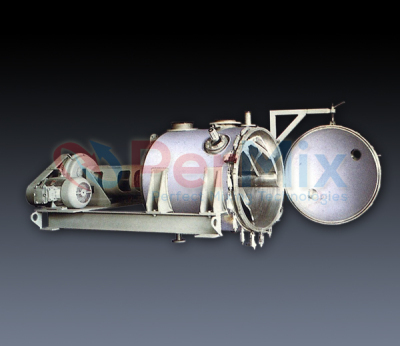 The filter chamber connected with the vacuum dome has a mechanically or pneumatically-operated device for cleaning the filter. Additional units for the removal of vapour or recovery of solvents take account of individual user requirements.